2010 September 20 » Embroidery Talk Has Moved! By now I’m guessing that most of you are familiar with the fact that EnMart has four locations. There is EnMart Corporate in Michigan, EnMart East in New Jersey, EnMart West in Nevada and EnMart South in Georgia. 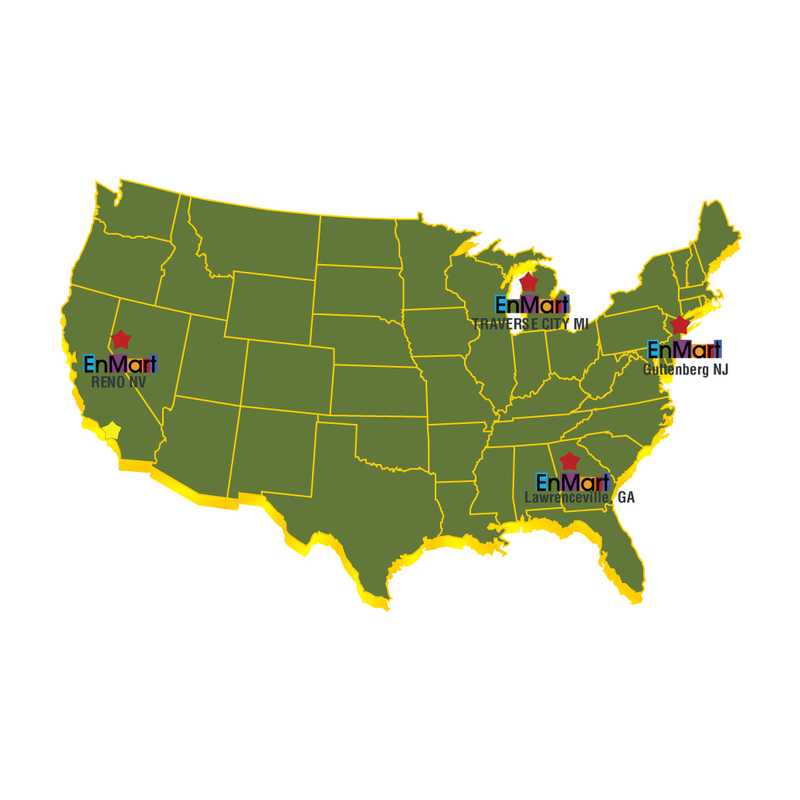 Our locations were strategically placed to ensure that we are at most a two day Ground Shipment from a majority of locations in the United States. These locations also allow us to offer local pick-up to customers who are within driving distance of one of our facilities. One of the things that has always been a bit confusing for some people is that fact that our locations are not stores, they’re warehouses. Each location does double duty as a production facility for our parent company, Ensign Emblem, so our locations tend to be located in industrial parks, not in strip malls. The EnMart locations are not showrooms, where product and equipment are on display, they are warehouse and production facilities with offices attached. Viewings of product samples or equipment demonstrations can be scheduled upon request, but the facilities are not set up for walk in visitors. We do, however, welcome scheduled visits. If you are interested in picking up an order on site, or want to view a particular item before you buy, simply call 866-516-1300 and schedule on on site visit with on our Customer Service personnel. To make it easier to find our locations, we have also updated our Locations page. This page now contains street maps showing the location of each facility. It also provides the ability to enter your location and get precise step by step directions to the EnMart facility of your choice. Our goal, as always is to make it as easy for you to do business with us as possible. Offering interactive maps and precise directions will help our customers find us faster. On site pick-up means that customers who live in close proximity to one of our locations can pick up their orders and thus avoid shipping charges and longer waits for their merchandise. Quick and easy scheduling of appointments and processing of orders means that you won’t have to wait if you do decide to visit an EnMart location. Advance scheduling will ensure that everything will be ready and waiting for you when you arrive.